Toilet Seat (Raised) with Tool Free Removable Padded Arms . Drive Medical has manufactured this elevated toilet seat with you in mind. The tool-free removable padded arms allows this product to be used in a wide range or different bathroom configurations, and makes storage of this item easy. The heavy-duty molded plastic construction ensures adequate strength and durability. 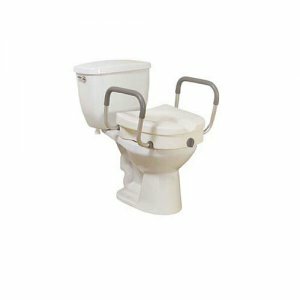 A clamping mechanism locks safely and securely onto your toilet to prevent shifting of the seat while transferring to and from this product. The elevated seat and padded arms will help individuals who need a boost sitting down or standing up from the toilet. For consumers using a wheelchair tool free removable arms allow for easy transfer to and from the raised toilet seat. 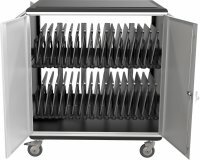 Seat (Width): 15.5"; Seat (Depth): 16"; Seat (Height): 5"; Width Between Arms: 18"; Product Weight: 4.5 lbs.